All it takes is a night out, which can lead to the serious consequence of being charged with Driving While Intoxicated (“DWI”). A DWI arrest can affect your future, including your job, your finances and your family. Whether it is your first DWI or your third, Chappell, Lanehart & Stangl will defend you aggressively and effectively. Although it is a common criminal charge in Texas, there is not a template or outline to follow in defending someone charged with DWI. Avoid criminal defense attorneys that rush your case and avoid communication. They are likely focused on moving a case as quickly as possible, ignoring along the way the myriad issues that are unique to DWI defense. Remember, if you feel your attorney is not doing everything possible to help you, you can make a change and find a new attorney to represent you and give your case the attention it deserves. In Texas, DWI means driving or operating a motor vehicle after having lost the normal use of mental or physical faculties, or by having a blood alcohol level over 0.08. This loss could be due to alcohol, illegal drugs, or even over-the-counter cold medicine and prescription drugs. Additionally, a DWI charge becomes more complicated if drugs or an open alcoholic beverage container are found in the vehicle at the time of arrest. Typically, a driver is pulled over by police for some reason, such as erratic driving, and asked to complete several field sobriety tests. If the decision is then made to charge someone with DWI, the police will make the arrest and then request consent to obtain a breath or blood sample. If the person refuses to give a sample, the police have the ability to seek a search warrant to take the person’s blood against his or her will. Importantly, whether or not a person consents to give a sample, the decision can affect the case, including the potential length of a subsequent driver license suspension. Even without an alcohol concentration determination, a person can still be charged with DWI. 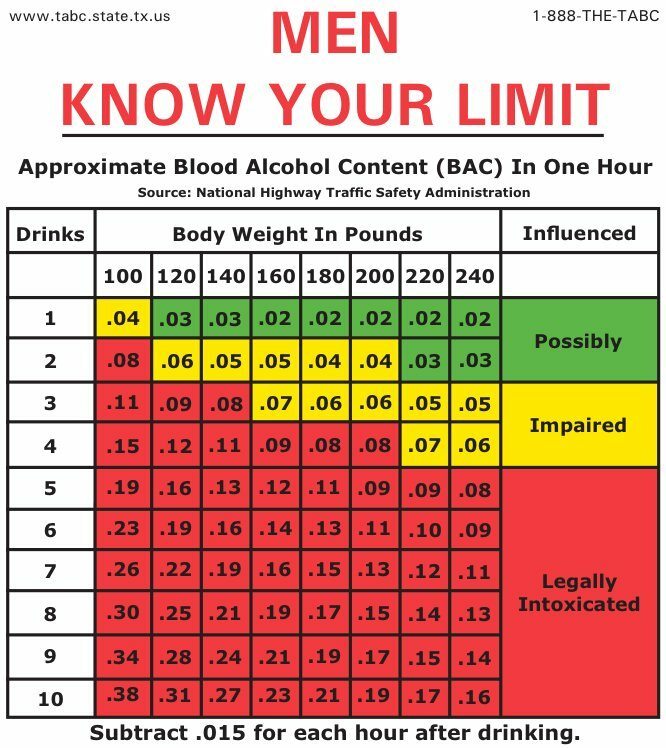 Alcohol concentration level can also enhance penalties and drastically affect defense strategy. A DWI with an alcohol concentration level of 0.08 or more is usually a Class B misdemeanor (up to 180 days in jail and an optional fine of up to $2,000), but if it is over 0.015 (almost twice the legal limit), a DWI is treated as a Class A misdemeanor (up to one year in jail and an optional fine of up to $4,000). For minors or adults under the age of 21, driving with any amount of alcohol in your system is against the law and referred to as a DUIM (Driving Under the Influence by a Minor). Each year, the Lubbock Police Department announces DWI arrests. 2017 experienced an increase in arrests, although the number is lower than 2014. Lubbock County now has no refusal weekends at all times of the year, which require blood tests for alcohol if drivers refuse a breathalyzer. Many people charged with DWI are first time offenders without any criminal history. While there is the possibility of jail time if convicted, community supervision (probation) is the more likely outcome in the average case. Even with community supervision, the Texas Department of Public Safety (“DPS”) can pursue a surcharge of up to $2,000 per year for three years upon conviction for DWI. While this surcharge can be waived in certain circumstances, it is a very real, very serious consequence that must be considered. DWI convictions also usually result in much higher auto insurance rates. Additionally, a DWI conviction can be used in the future to enhance the penalty of any subsequent DWI charge. Review our article for additional consequences of a DWI conviction. At Chappell, Lanehart & Stangl, our goal is to pursue every available option in order to prevent DWI conviction. Typical solutions are to seek an acquittal at trial or negotiating a more favorable resolution with the prosecution. Other possible resolutions to a DWI charge include pretrial diversion or “charge bargaining,” which means the client pleads to a different, less serious charge (i.e. Reckless Driving, Obstruction of a Highway or Deadly Conduct). Any of these options will result in dismissal of the DWI charge, although some outcomes are better than others. We would be happy to visit with you to discuss in more detail all of the possible options in your case. It is important to note that in 2017, Texas allowed certain first time DWI convictions to seal arrest records by requesting an Order of Nondisclosure. This results in the conviction being sealed and unavailable in most circumstances. While this is a welcome change in the law, it does not have the same advantages of an expunction, which is only available when a DWI is dismissed. DWI is a very serious charge, and prosecutors treat it is as such. But it is important to understand that conviction is inevitable or that you have no other option than to plead guilty. If you have been charged with DWI, we would enjoy the opportunity to answer your questions, guide you through the entire process and make every effort to help you achieve the best result possible in your case. "It has been an unfortunate and extremely stressful time in my life, but Mr. Lanehart especially helped to calm me down and understand that these things happen a lot more than expected, and that it could have been a lot worse. I would also like to thank Mr. Stangl for representing me in court on January 28th of this year. Overall, the experience has been very helpful from y'all during such an overwhelming period of time for me." Charged with DWI, Public Intoxication and disciplinary matters with the Office of Student Conduct. Thank you & your office staff for taking such good care of me. You saw me through my hour of need. Thank you again for such expert service. Results: Charges reduced to reckless driving, client was granted a probation. The DWI was dismissed. In a contested hearing in a DWI case, the judge threw out the only standardized field sobriety test administered by the investigating officer. After the hearing, the prosecutor dismissed the case altogether. Additionally, based upon the result of the hearing, the Texas Department of Public Safety abandoned its attempt to administratively suspend the client’s driver’s license, based upon his refusal to give a breath specimen. Utilizing a two-pronged defense, Chuck Lanehart this month successfully obtained a dismissal of a DWI case for a young college student. The student was involved in a traffic accident, and police obtained a search warrant to obtain the student’s blood to be analyzed for alcohol content. A former director of Lubbock’s animal services received 18 months of probation, after pleading guilty to two class A misdemeanor driving while intoxicated charges in 2012 and 2013. Fred Stangl represented the former director, and secured a dismissal of felony theft charges of up to $20,000 as part of a DWI plea deal.